To engage students educators must endeavor to capture World and United States history through a local lens. This usually requires local historic resources be available for teachers to use or the teacher must find them for themselves. It is up to the teacher to then adapt these resources to their students’ level and create “hands on, minds on” activities. Many resources can be found in the links below. An even richer learning experience occurs when the student is actively engaged as both researcher and teacher. This website features the local lens applied from Massachusetts to Arizona, but the applications are often universal. One message from using individual biographies in the classroom comes through loud and clear–ONE DOES NOT NEED TO BE A VICTIM OF CIRCUMSTANCE. Teenagers have the power to take charge of their character and the decisions they make. By these choices, they affect others’ lives and therefore MAKE HISTORY. 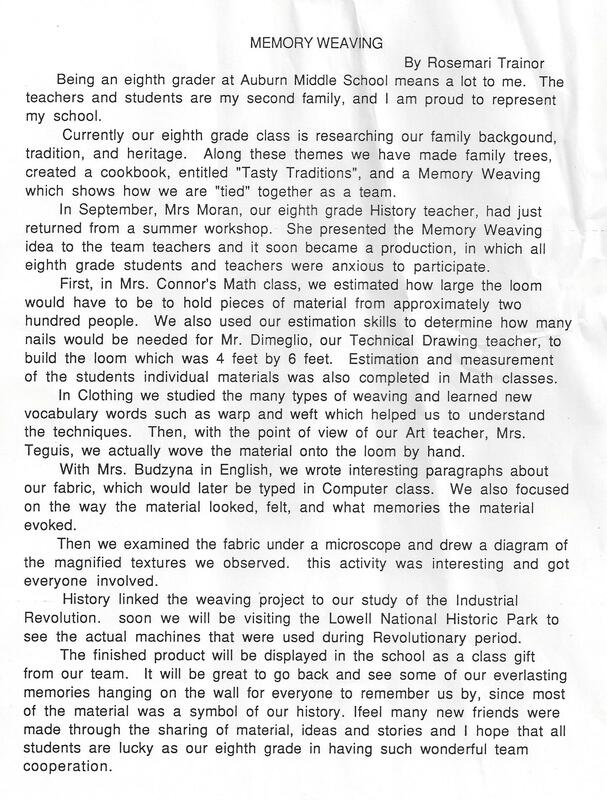 Inspired by participation in the 1986 Old Sturbridge Village Archaeological Field School and a presentation by Neill DePaoli at the 1987 Northeast Regional Conference in the Social Studies, Moran decided to write this unit through the Horace Mann Grant Program. It was a reaction to losing her regular classroom position and being re-posted to Project C.O.F.F.E.E, an alternative classroom with the Oxford Public Schools. 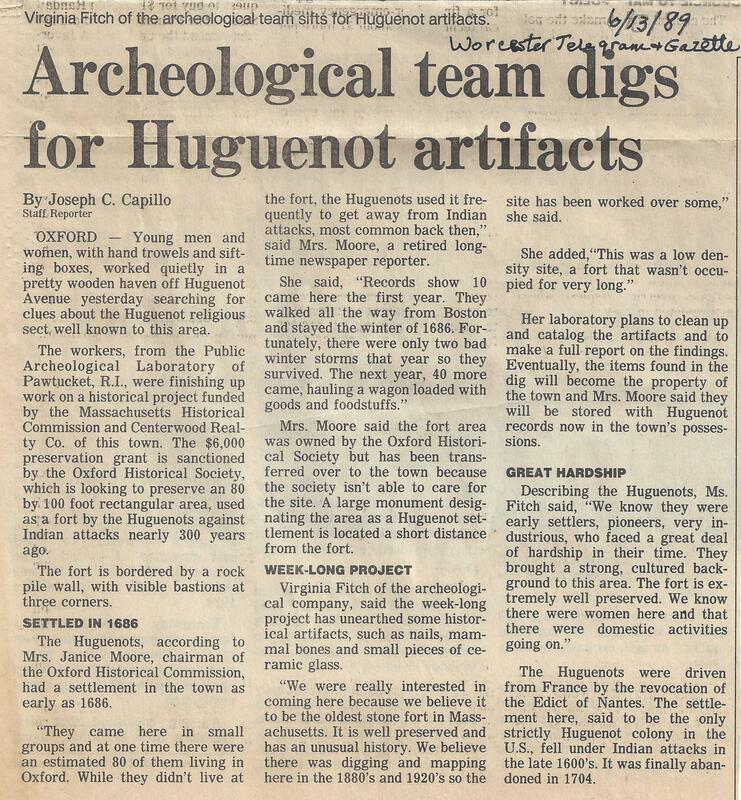 Although adapted for alternative classroom, Moran was able to take seven students to visit an active archaeological dig to expose them to the wonders of finding clues from the past. While unable to actively participate at the time, these building trade students created an information sign for the Huguenot Fort site. The key to units and lessons like this one is it can be adapted to other communities if teachers are willing to connect with their local historical society, library and other local community resources. Why is Auburn, Massachusetts’ Main Street a Dead End? Every community has female voices that can introduce key concepts in American history and empower today’s students to become participatory citizens. INDIVIDUALS MAKE HISTORY! Nantucket had a Petticoat Row and Worcester had Edna Smith Tyler, the first female public stenographer and business school owner in Central Massachusetts. HELP STUDENTS DISCOVER THE ECONOMIC IMPACT OF WOMEN IN YOUR COMMUNITY! A variety of different ethnic groups can be found in every American community, but finding evidence of their stories is not always easy for classroom teachers. This list and “We’re Still Hanging Around” site for the Worcester Women’s History Project is a model for any town where portraits of women (and men) are found. It is an excellent way to bring local history to life and encourage students to do primary source research. Imagine being paid wages for your homework! Will you use this money to become a capitalist? Many opportunities arise during this economic unit woven throughout the social studies curriculum as America rebuilds after the Civil War. Students gain insight into their personal choices, vocabulary and understanding of historic events while forming a corporation, dealing with labor versus management struggles and the temptations of easy credit before the 1929 stock market crash. Friendly Stock Broker offers an opportunity to take a risk. “I bought on margin. I have no money and am unemployed. I learned not to buy when price goes up. They foreclosed on my desk so I am homeless, too.” Luckily, this student was “hired” by one of the “rich” students who chose to invest her capital in a new company and was able to return to his desk. The class had an interesting discussion on how to solve the problem of a slow economy. This unit was created as part of “Opening Your Classroom Window to 19th Century America” to serve as a resource for Auburn educators and a model for finding historic women in other communities to use as a local lens to teach American history. Helping bring the Industrial Revolution into our students’ lives was greatly helped by visiting The Lowell Industrial National Park and participating in Lowell Industrial Learning Experiences both in and out of the classroom from 1989-2005. By having all of the classroom disciplines involved in connecting the experiences to their curriculum, students were able to experience a wide variety of historic events that help them become more aware of their society and work experience. Advocates of woman’s rights, abolition, temperance and more at Women 2000. The Worcester Women’s History Project (WWHP) is a nonprofit all-volunteer educational organization dedicated to celebrating and documenting the contribution of women to the history, social fabric and culture of Worcester and beyond. Worcester was the site of the first National Woman’s Rights Convention in 1850 and home to Abby Kelley Foster, radical abolitionist and women’s rights activist. 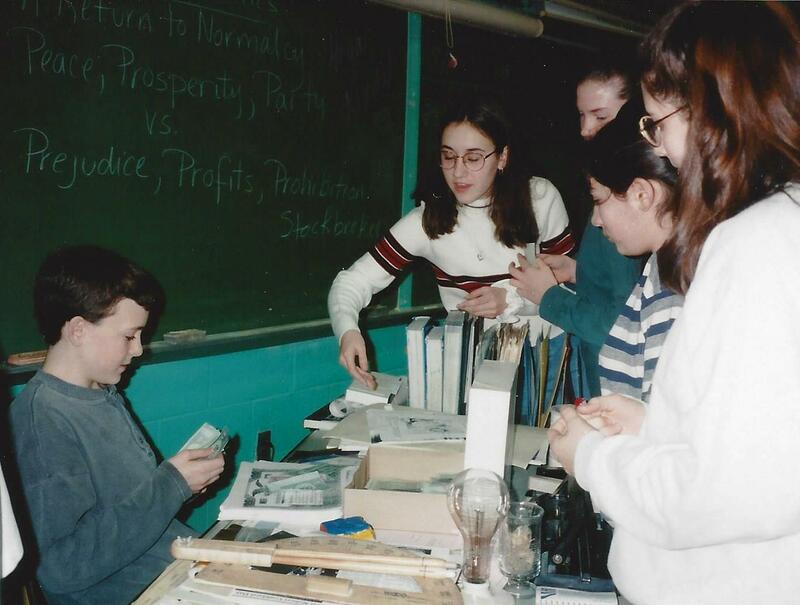 The following lessons were created to involve students in opening windows on the past. To mark National Women’s History Month, the Telegram & Gazette Newspaper in Education program in collaboration with the Worcester Women’s History Project presented a series of portraits of notable women. Teacher resources and a timeline paralleling national events during the life of AbbyKelley Foster will help audiences better understand America during the mid 19th century and Abby’s goals. Pre and post lessons are available in PDF format to help students better understand the issues raised by this play set in 1854. 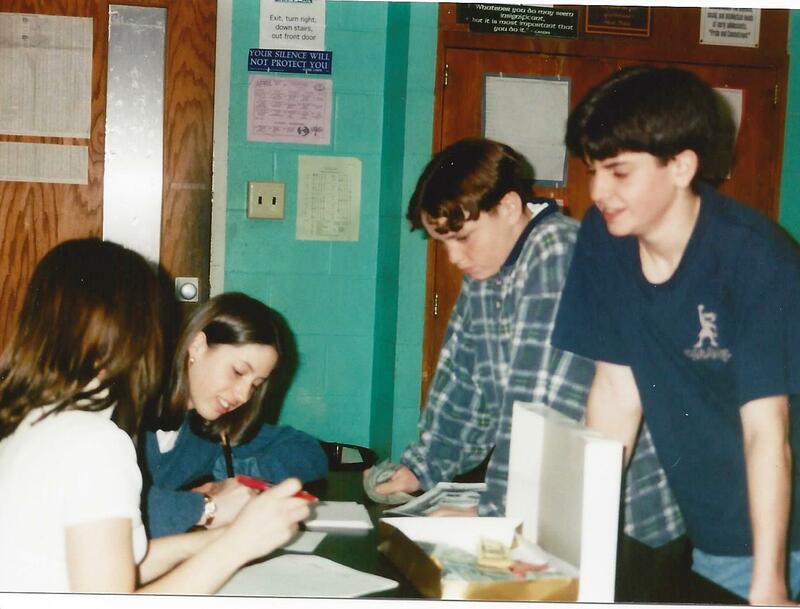 These include primary source documents and critical thinking activities with a Massachusetts History and Social Science Frameworks Menu for grades five through high school. Pre and post curricular materials designed to support this dramatic presentation of the first National Woman’s Rights Convention by Louisa Burns-Bisogno features related convention materials, an 1850 railway map, an 1851 map of Worcester’s Main Street, biographical information on several hard-to-find personalities who attended this historic event in 1850: Sarah H. Earle, Rev. John B. Forman, and Abby Hills Price, and lesson ideas for the portraits at Mechanics Hall. 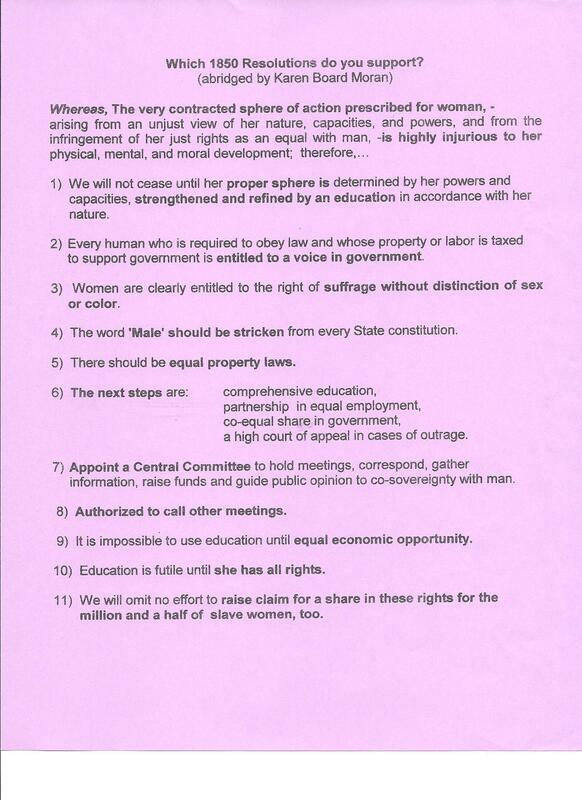 The following materials may also be used with the classroom script “Window on the Past: Revisiting the First National Woman’s Rights Convention” (2000). 1850 Members of the first National Woman’s Rights Convention, October 23-24, 1850. The following have individual biographical information found by and for reenactors portrayed in “Angels & Infidels”. 1850 RESOLUTIONS of the first National Woman’s Rights Convention, October 23-24, 1850. Unlocking the 1850 Resolutions of the first National Woman’s Rights Convention. 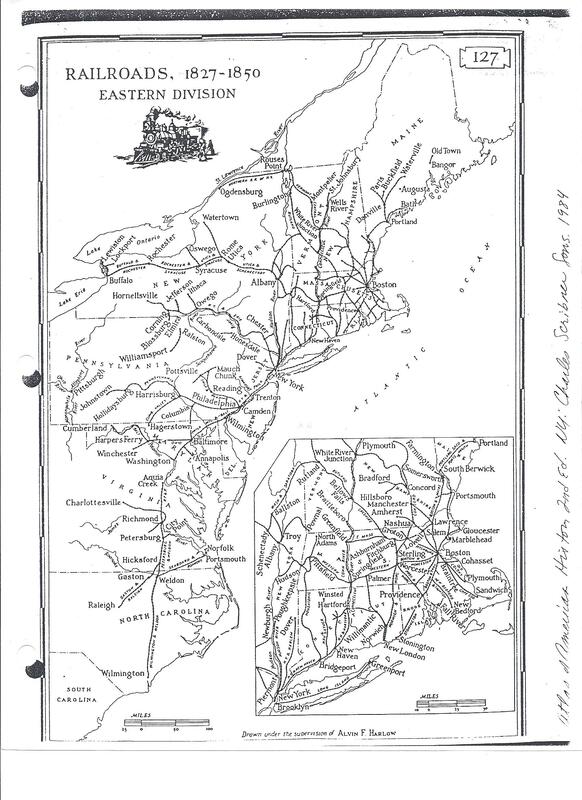 Map of Railways in New England, “Pathfinder Railway Guide”, 1850 at American Antiquarian Society. 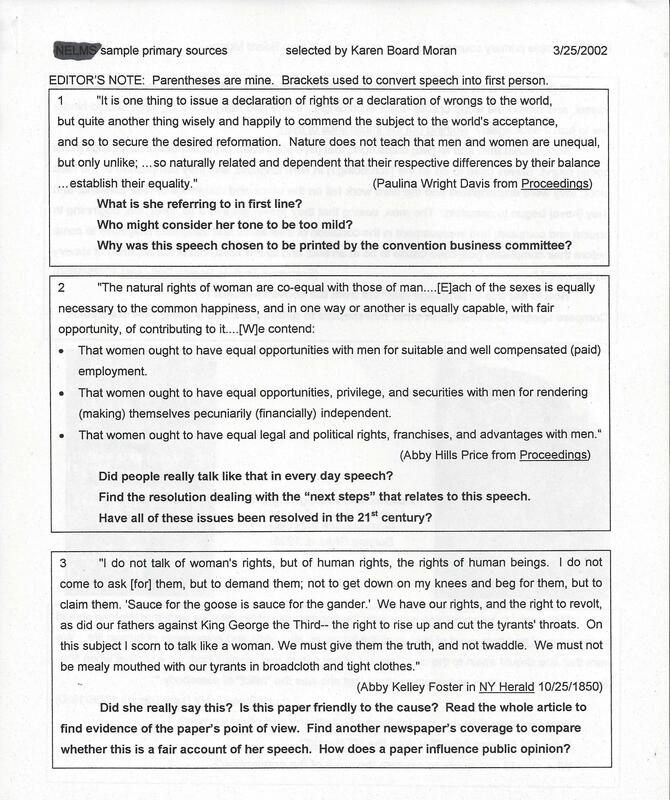 Overview of the first National Woman’s Rights Convention, compiled by Karen Board Moran, 2000. Railroads, 1827-1850, Eastern Division, Atlas of American History, 2nd Ed. (NY: Charles Scribner Sons, 1984). 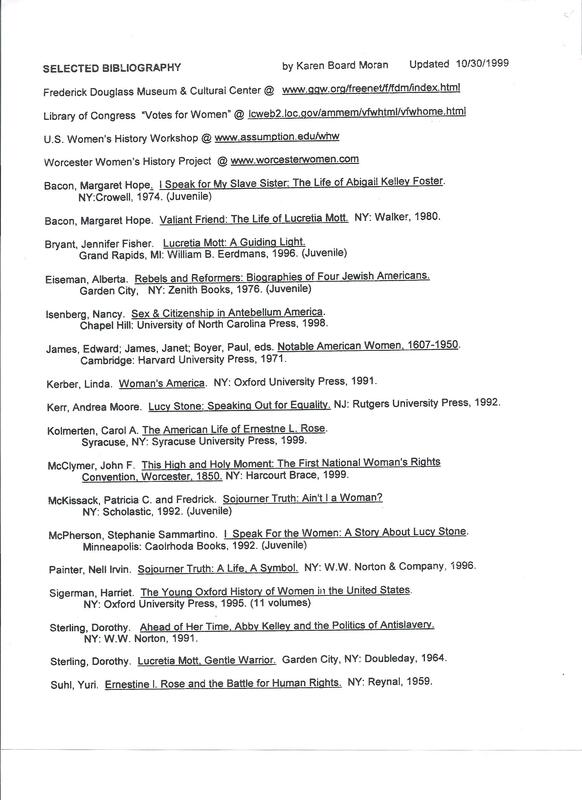 Selected Bibliography for the first National Woman’s Rights Convention, October 23-24, 1850. Web Sites for 1850 Research, Karen Board Moran, 2000. Which 1850 Resolutions Do You Support? abridged by Karen Board Moran. Worcester Members of the first National Woman’s Rights Convention, 1850. Example of good marketing in Worcester Spy, 31 October 1850. We’re still hanging around – Can you find us? What questions would you ask me if I could speak? Where can you look for my words? Where did I live, work and die? Why was I chosen to have my portrait hung out of the many women who shaped their world, and in turn, the future? So what has happened to my cause in your time? What bibliographical resources did you use? This on-going project of the Worcester Women’s History Project encourages citizens to share information about women whose portraits are hanging in buildings around Worcester County. “More Than a Picture on the Wall” honors the first portraits of important area women–Clara Barton, Dorothea Dix, Abby Kelley Foster, Lucy Stone–added to the Mechanics Hall collection. 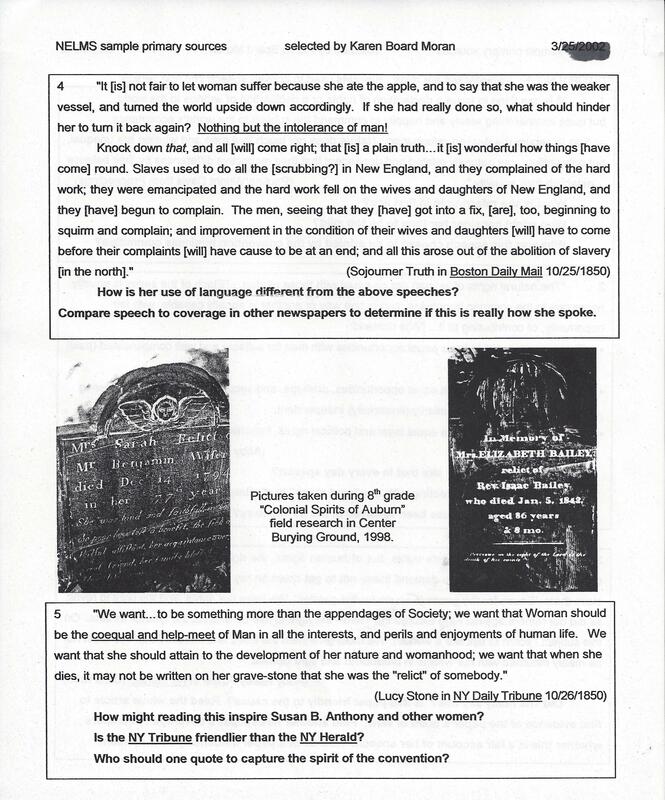 The Women’s History Workshop was a collaborative effort of Massachusetts teachers — middle school through college — which sought to make available primary sources in pedagogically imaginative formats for teachers who wish to use such materials in their own classrooms. The Workshop was sponsored by Assumption College, the American Antiquarian Society, The Alliance for Education, and the Worcester Women’s History Project. Initial funding came from the National Endowment for the Humanities. The following electronic lessons related to the celebration of the first National Woman’s Rights Convention. With minimal technology in the mid-1800’s, advertisers relied on newspapers and periodicals to persuade the public to buy their product or support their cause. 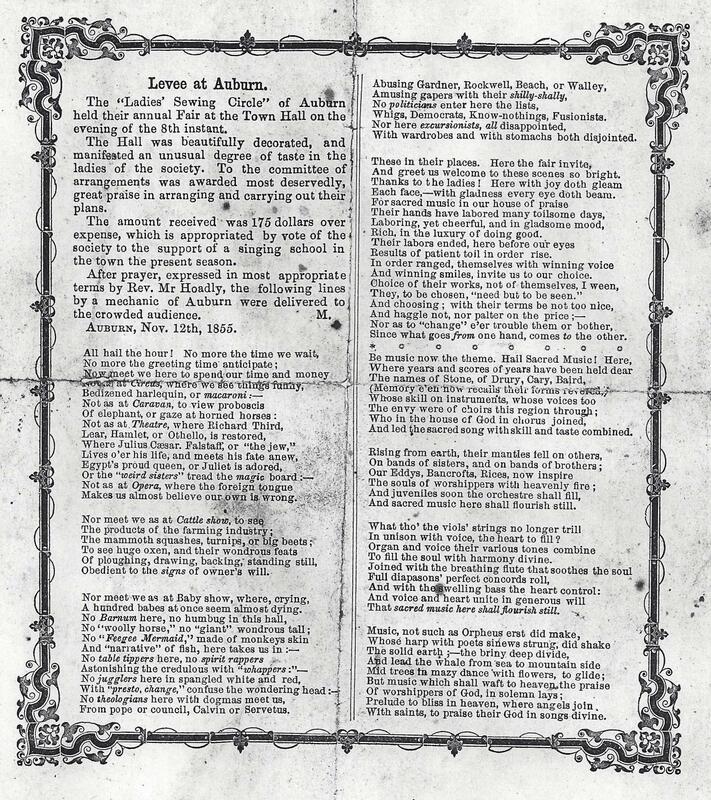 Many periodicals circulated supporting abolition and women’s rights. Besides persuasive motives, newspaper reporters often provided the only source or written historical record covering an event. Many articles demonstrate the bias of the reporter, which provides the reader with insight into the social mind set concerning particular topics of importance. Illustrations contained in some periodicals often provide the clearest testimony of the prejudices and stereotypes toward women as well as thoughts regarding the women’s rights movement. The Massachusetts Cataract is an example of one of the many reform newspapers that appeared in the North in the early to mid-1800’s. Printed in Worcester, MA., the Cataract focused on temperance. Its masthead (below) recognizes many significant issues of reform in society. Considering party politics, industrialization, transportation, and other reforms, what message does the masthead send to its readers? What hints of purity, cleansing, popular medicine (the water cure), or as a source of energy does the waterfall imply? Who or what might be going over the waterfall? To which events in the 1850’s could the messages on the flags at each end refer? Advice literature provides another rich avenue into the past. Americans were intensely aware that their society was changing very rapidly in the 19th century. More and more were coming to live in cities, engage in trade, or pursue professions not even imagined in their grandparents’ day. As a result, a huge quantity of advice literature sprang up, full of “how-tos.” While it is not possible to take these manuals as accurate descriptions of how most people actually behaved, one can take them as Prescriptions. Eighth grade students enjoy comparing these with 21st century advice. As the following comments show, it is important for teachers to weave women’s voice into HIS-story in a way that relates to their lives and encourages critical thinking. The best thing…was sharing how we learn how to act. It was interesting to learn how many different ways you can get information on this topic [today]. 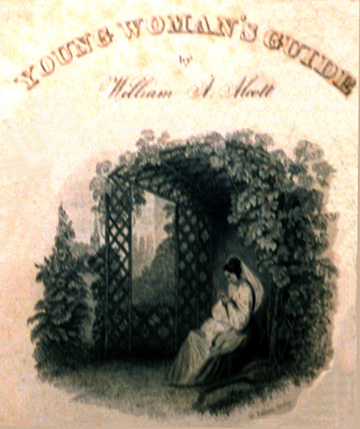 William A. Alcott stated that his book was written for “twelve or fourteen to eighteen or twenty years of age–and to those in general, who are single…[and] applicable…to all mankind” in the Preface of the 1839 edition of The Young Woman’s Book of Health (21). The new edition was advertised in the October 1, 1850 edition of Harper’s Weekly. Alcott signed in as a member of the first National Woman’s Rights Convention that month. Was he just selling his newly published book A Young Woman’s Book of Health or was he truly interested in gaining more rights for women? Alcott, William A. The Young Woman’s Book of Health. Boston: Tappan, Whittemore and Mason, 1850 at the American Antiquarian Society, Worcester, MA. .
Alcott, William A. 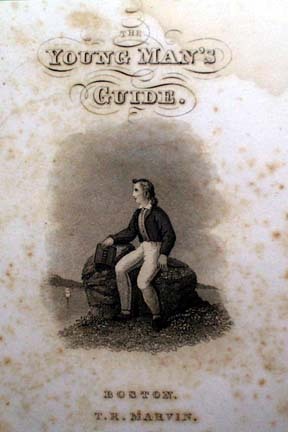 Young Man’s Guide. Boston: T.R. Marvin, 1846 (16th edition) at the American Antiquarian Society, Worcester, MA. How did the Transportation Revolution Affect the Woman’s Rights Movement in 1850? This WebQuest is designed to aquaint students with the means of travel and accommodations used to accommodate those who attended the Women’s Rights Convention in Worcester in 1850. Students will use maps and documents from the period to observe the facilities available to convention bound travelers. After a number of tasks are completed, students should have a better understanding of the significance of the transportation revolution that allowed the issue of women’s rights to develop. This workshop was presented by Emily Thomas and Karen Board Moran during Blackstone Canal Community Day Celebration 4 October 2003 at the Worcester Historical Museum to highlight a need for Dress Reform in the 19th century using costumes created for “Angels & Infidels”, the Women 2000 production. Participants were also able to try on these costumes to experience the weight of petticoats and tightness of a corset. 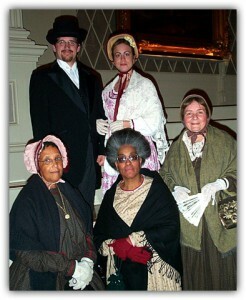 Visit Dressing the Victorian Lady from the 1850’s for an excellent visual and informational resource.